This Zambezi River cruise is a great way to end your day in Victoria Falls. 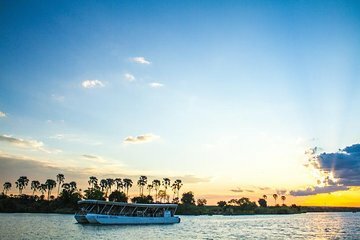 Float down the Zambezi River and look out for animals like hippo, crocodiles, elephants, and more in the wild while you relax on board and enjoy finger snacks, beer, wine, and soft drinks. Photographers especially love this tour—it’s a great way to catch the sunset. Your Hotel or Lodge located within Victoria Falls Town, Zimbabwe only.